To view a pdf flier, click here. For the form, click here. The Solo & Small Firm Section (SSF) of the California Lawyers Association’s Mission is to foster a supportive community for solo and small firm practitioners across all areas of practice, to guide our members on their path to becoming strong, competent and ethical solo and small firm business owners, and to recognize the accomplishments of solos and small firm professionals across the state. We accomplish our work through our standing committees which include: Education (Programming & Webinars), Awards, Publications (the Practitioner & the e-Practitioner), Diversity Outreach, Social Media, Community Service, and Recruitment & Engagement. SSF is an invaluable resource to Solo and Small Firm practitioners in California. The Solo & Small Firm Section of California Lawyers Association is a tax-exempt 501(c)(6) organization. For income tax purposes membership, sponsorship or event payments are not deductible as a charitable contribution but may be tax deductible as a business expense. Please consult your tax advisor should you have any questions. Thank you to SSF’s generous sponsors who make our events possible and support us in our mission. The SSF Gold Sponsor receives 1) logo on the SSF Section webpage; 2) recognition as Gold Sponsor and logo on the SSF Section Facebook page (pinned to top of page); 3) 5 tickets to all SSF in-person programming; 4) recognition on signage at all SSF in-person programming; 5) recognition from the podium at all SSF in-person programming; 6) recognition on signage at the SSF Awards Reception at the Annual Solo & Small Firm Summit; 7) recognition from the podium at the SSF Awards Reception at the Annual Solo & Small Firm Summit; 8) quarter (1/4) page advertisement in a full year of the Practitioner, the Section’s quarterly magazine; 9) Recognition as Statewide sponsor in the Practitioner; 10) Logo with back link and recognition on e-Practitioner. The SSF Sponsor receives 1) logo on the SSF Section webpage; 2) recognition as an SSF Sponsor and logo on the SSF Section Facebook page (pinned to top of page); 3) 3 tickets to all SSF in-person programming; 4) recognition on signage at all SSF in-person programming; 5) recognition from the podium at all SSF in-person programming; 6) Recognition on signage at the SSF Awards Reception at the Annual Solo & Small Firm Summit; 7) Recognition from the podium at the SSF Awards Reception at the Annual Solo & Small Firm Summit; 8) Recognition as Statewide sponsor in the Practitioner; 9) Logo with back link and recognition on e-Practitioner. *Small Firm is defined as a firm with five (5) or less attorneys. SSF hosts four (4) live programs each year across the State. Two of these MCLE programs are focused on issues specific to Solo and Small Firm practitioners and two will be held in conjunction with one or more practice-area based Sections of California Lawyers Association. Each price below reflects per program pricing. Purchase sponsorship for three programs and receive the fourth free! You are a Champion! Recognition on all electronic and print signage related to the program; recognition from the podium; recognition on social media. 2 tickets to the program. Thank you for your support! Recognition on all electronic and print signage related to the program; recognition from the podium; recognition on social media. 1 ticket to the program. 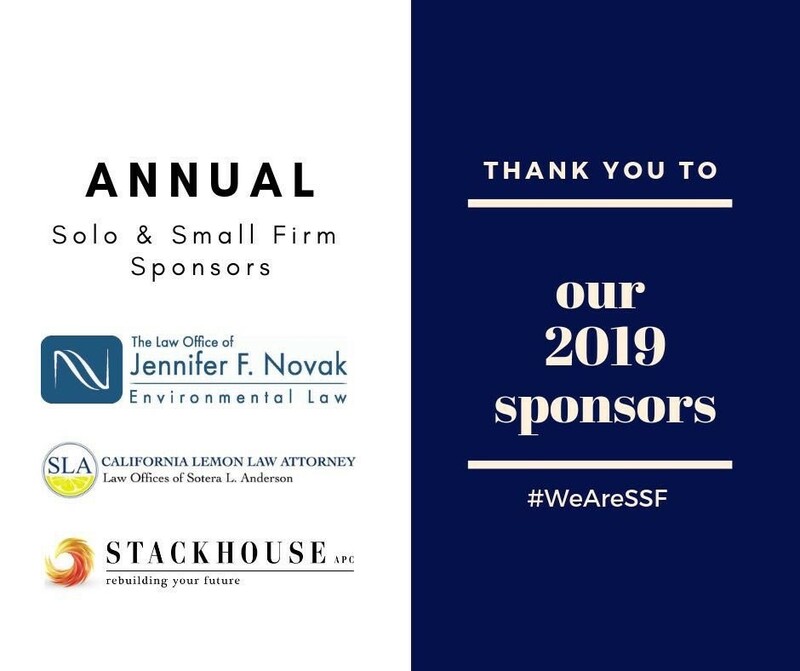 Held annually at the Solo & Small Firm Summit, SSF will present awards to outstanding recipients including an Attorney of the Year and Community Service Award. Be our Honorary Host! Recognition as the Title Sponsor on all electronic and print signage related to the program; recognition from the podium; one minute welcome statement by company representative; recognition on social media. This drink is on you! Recognition as the Wine Sponsor on all electronic and print signage related to the program; recognition from the podium; recognition on social media. Presentation is everything! Recognition as the Award Sponsor on all electronic and print signage related to the program; recognition from the podium; recognition on social media. Let the honorees know that you’re a big fan of their contributions! Recognition as Friend Sponsor on all electronic and print signage related to the program; recognition from the podium; recognition on social media. Advertise in the PRACTITIONER, SSF’s quarterly print magazine with a distribution of 1,600+. Be the driving force that brings substantive and relevant articles to the SSF membership as the sponsor of the Section’s magazine. The Practitioner sponsor will be included in recognition with the Section’s Annual Sponsors in each issue, receive recognition on the SSF Section Facebook page, quarter (1/4) page advertisement in a full year of the Practitioner and 3 tickets to each SSF in-person program. Buy 3 issues print rate (per issue) get one free ad- same size. To become a sponsor, please fill out this form, or email Section Coordinator John Buelter. Sponsor three programs and get the 4th free! Buy 3 issues and get one free ad- same size!